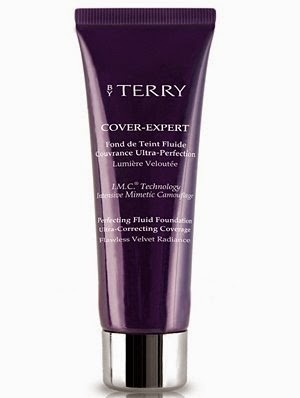 Cover Expert foundation from By Terry has been around for a while so I may not be telling you anything new but just wanted to draw your attention back to it for a moment. A lot of foundations don't perform well on a combination or oily skin. They move, get a curdled appearance or change colour when they mix with the oil. Likewise just because the skin is oily you may not want a powdered finish and still want to look dewy to a certain degree. Wow oily skins just want it all hey!! This foundation ticks all of those greedy needs, although as always it's not cheap at £45.00. If you stress over your foundation though it's worth the extra money. Not a massive tube at only 35ml but a little goes a long way. The coverage is medium to full but totally adaptable. I don't like my foundation too heavy so just buff a small amount over for a natural cover. It is easily built up to a much fuller cover though if required. It feels like velvet as you blend it over and the skin instantly appears matte without a cakey look. Skin tone is totally evened out. I only needed a few dots of concealer on old blemish scars which I normally have to use much more concealer on. It's matte but without the flat dull finish. Imagine 5 denier tights over your face and you've got the look and feel of this foundation. Available in 14 shade options in a mix of peach, pink and olive tones. It contains colour mimicking pigments which adapt on the skins natural oils so it is easy to make it work for your skin tone and if you're a makeup artist it's a good one to have in your kit in a few shades as these mix well to create new shades. No SPF and a minimal amount of titanium dioxide so photographs well. Also contains Hyaluronic acid which attracts water to the skins surface resulting in a plumped fresh skin texture. Great for fine lines and dehydration. This foundation would work on a normal skin also but on a dryer skin you may need to blend it with your moisturiser or apply quickly on top of a hydrating primer. It does feel dry on the skin so if you have any skin texture such as flaking this is probably not going to sit amazingly well on top. The only negative is that it does have a strong perfume scent which may be off putting if you are adverse to strong scents. It is a nice scent though and you quickly get used to it. The colours we tested do tend to air on the side of peach which is great for an ashy, dull skin tone or if you suffer from under eye darkness. The peach does tone down once blended in. If your skin is particularly oily you may still need a light dusting of loose powder across the T-zone just to ensure it lasts better throughout the day. I found this still looked fresh after a day at work with only a minimal touch up of my powder. You can get hold of this foundation from http://uk.spacenk.com and if you can only purchase online do check their site out as they have live online assistance who are great at talking you through colour options. I wish I could get my hands on so many of ByTerry stuff! everything sounds brilliant! this sounds good but a little bit out of my price range! Thank you so much for swatching them! I think I can tell which one would be right for my skin now before I buy it online! Excellent post! In this busy world it is not always easy to take a step back and treat yourself to a little fine tuning. With age, new problems seem to continually arise, so finding solutions to them is necessary in order to keep your body looking its’ best. There are many things which seem to all too often change on your body, but one of the first things people seem to notice is dry skin and those overly annoying dark spots under your arms. Getting rid of either one seems to be pesky, but you don’t have to break the bank trying to solve these issues.